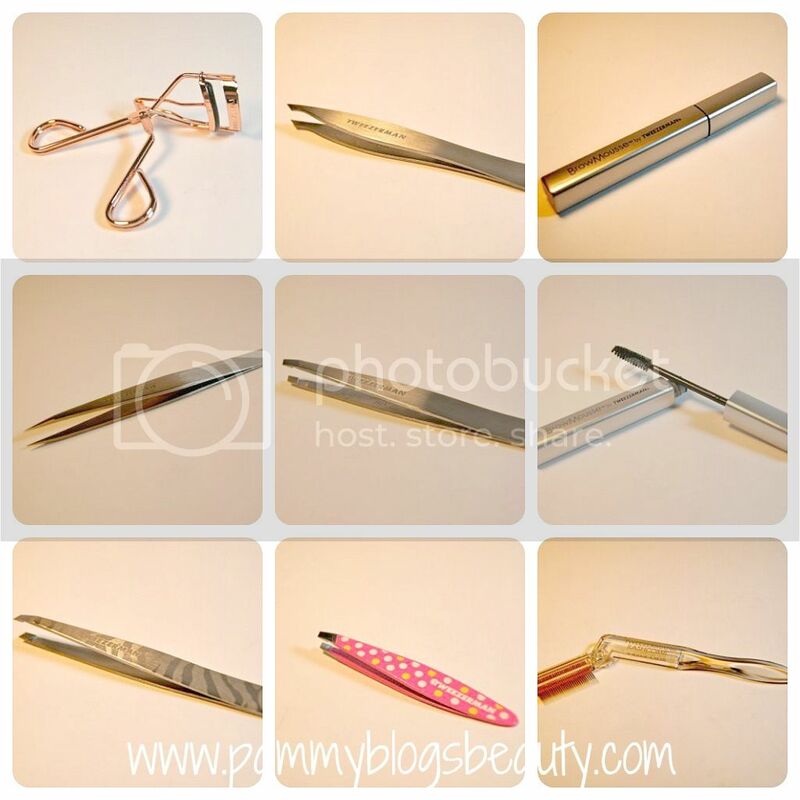 Pammy Blogs Beauty: I am a Tweezerman Ambassador! I am a Tweezerman Ambassador! Hi everyone! I am very excited to announce that I am now a proud new member of the Tweezerman Ambassador program! For those that are not familiar with the brand, Tweezerman is a cutting edge and high-quality professional beauty tools brand. They are known for having some of the best tweezers on the market! As someone blessed with copious brows, good tweezers are a must for me! The Tweezerman ambassadors are a select group of bloggers and vloggers that have access to Tweezerman tools as well as the opporutnity to test out an assortment of amazing Tweezerman products/tools. I will be able to bring you the scoop on permanent parts of the Tweezerman collection as well as keep you posted on new products and new releases! To welcome me to the Tweezerman Ambassadors, Tweezerman sent me an amazing welcome gift: A roll-up case *filled* with Tweezerman tools! I am in tweezer heaven right now!!! My Tweezerman kit arrived a couple weeks ago and I have been in the process of getting to know and use my new tools. My plan is to fully incorporate these tools into my everyday beauty routines. You will see these tools featured in upcoming product reviews. Also, you will likely hear these tools mentioned in "how-to's"/tutorials and favorites lists as well (Yes, I am already finding some new favorites here! Word!). To find out what is in my kit, please keep reading after the jump! So, what is in my Tweezerman Roll-Up Case? When I tell you that I am in tweezer heaven, I am totally not kidding! Tweezerman has spoiled me already! This case holds 5 tweezers, a sharpener, a brow gel, brow comb, brow pencil, brow spoolie brush, and brow scissors. Oh, and an eyelash curler too! So, 12 tools in all. Wow! Slant Tweezer (Stainless Steel): For more than 30 years, Tweezerman's award winning Slant has been the choice of makeup aritists, models, celebrities, and those who demand the very best. I must admit, I have already grown to love this classic tool! Satin Etched Zebra Slant Tweezer (Stainless Steel): This is a snazzy patterned version of the classic slant. Top eyebrow artists always recommend the original, award-winning slant for expert brow shaping, now in this luxe etched print. Point Tweezer (Stainless Steel): I like this one when I just need to pluck away a random stray in my brow. Famous for its precision, the Point features perfectly aligned hand-finished, ultra-sharp pointed tips that grab the smallest and finest hairs with ease. Pointed Slant Tweezer (Stainless Steel): This uniquely designed tweezer with perfectly aligned hand finished tips combines the easy handling of Tweezerman's Slant with with the precision of the Point. Mini Slant Tweezer (Stainless Steel with Enamel Color Finish): Ya'll know I love this one!!! It is pink with polka-dots! So darn cute!!! This is a smaller version of Tweezerman's classic slant. It is just perfect for your purse or travel! I know that I for one MUST have a tweezer with me at all times for those mutant hairs that randomly crop up (is anyone else with me on this! Those must be plucked immediately!!!). 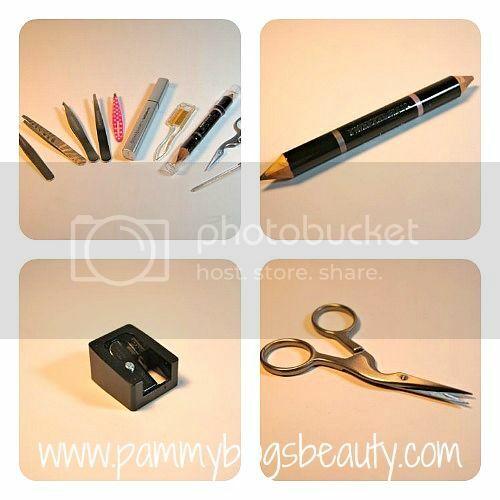 Enhance Pencil and Sharpener- I can always use a good brow pencil! The dual-ended pencil features both a universal brow color brow pencil and Highlighter that work together to create perfectly shaped luminous brows. Brow mousse- Not only are my brows thick, but also they are unruly too! I can't live without brow gel. So, this product looks just right for me! Ideal for getting a beautifully shaped brow line to stay put all day...or for taming "disobedient" unruly brows. ProCurl Lash Curler- This lash curler is so nice! Designed with unique control, this next-generation, professional-quality eyelash curler's sleek body-shape with large opening is crafted to exceed the standards and performance of any other curler on the market today. Folding Lash Comb- Have you ever used one of these before? They are great for working clumps out of your mascara! The perfectly spaced, gold plated metal teeth glide through lashes to remove excess mascara, leaving your lashes looking long, lovely, and clump-free. Brow Shaping Scissors & Brush- I am sooooo glad to finally have some brow scissors! For ages I have just been using random scissors to trim my brows. As you can imagine, that never works well! These work great because of the size and shape of the scissor blades. Outfitted with sharp, ultra-thin precision blades so you can isolate each hair with optimum accuracy and control. Use included mini-brush to help shape and define brows as you trim. If you have never tried a professional-quality tweezer before, I highly recommend that you check out the Tweezerman line. A great tweezer with a firm and precise grip can make your eyebrow plucking much less frustrating as the tool will allow for a quicker and more precise pluck (and this means less pain!). Stay tuned for reviews of many of the items from my Tweezerman kit! If there is anything in particular that ya'll want to see reviewed first, please let me know! In the meantime, know that I will be having a lot of fun testing everything out! @Krystal-Thanks girl! I am so excited about it. The tools are all really amazing! The best tweezers that I have tried! I had to split mine with my blog partner. I wanted to keep them all a secret since these tools are amazing. I love the tweezers, the eyelash comb and the lash curler. Fabulous!